Should you be looking for a symbol of change in your corporate office? Well, look no further than a bow tie! Besides providing the wearer with some upper collar shirt pizzazz, this stylish and fashionable enhancement will set the custodian with a unique and highly noticeable position of business grandeur amongst your fellow work colleagues. Let’s start with the basics. Firstly, forget your clip on bow tie, seriously, what’s the point! These are OK if you are 3 years old and don’t know any better and probably can’t tie your shoe laces either. However, if you are an adult, it must be a hand tied bow tie. Once you have mastered the tying procedure, a certain sense of personal achievement will have been attained, a skill that the wearer can most definitely list on their CV with pride and accomplishment. 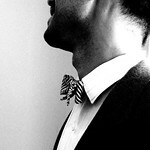 In my office, I recently had the joy of adorning a bow tie for a 6 week period. I decided to wear this fashion statement to personally support a cultural change management program that had been initiated within my organization. Now besides getting quite a few inquisitive looks from strangers I traveled with on public transport to and from the office (I still think it was bow tie envy), and from those I work with in the office, to me, the bow tie experience was quite profound and enlightening. So, what did I learn from a corporate leadership perspective that can be used in a change management program? 1. People noticed the bow tie (if you want to be a leader, you need to be noticed). 2. You can’t wear the same coloured bow tie each day (a leader needs to tailor the message for co-workers that can be readily understood, it can’t be a general communication). 3. The bow-tie was hand tied (it takes skill and some persistence to be a leader, the process needs to be practiced). 4. Bow-ties don’t suit everyone (some people like to follow…..and wear the traditional long length and rather boring and conservative tie, but then again, we wouldn’t want everyone wearing a bow tie!). So, next time your organization is thinking of implementing a program of change, may I suggest you go and purchase a hand tied bow tie and start wearing it in the office. Yes, you will be noticed, you will feel different from the masses, but you will be making a fashion statement, and you will be a Leader! Ah yes, memories of the 6 week bow tie campaign. I forgot that it was unusual in the end. I think it was boy tie envy also! Good post! And good for you!